Click here to jump to product specifications. The HX8610 Vertical Machining Center (VMC) is an incredibly versatile benchtop CNC milling machine, suitable for all skill levels. It is perfect for machining metals, plastics, woods, and more in a classroom, garage, or office environment. Because the HX8610 VMC is designed to operate on standard 120v power, phase converters or room modifications are not needed. 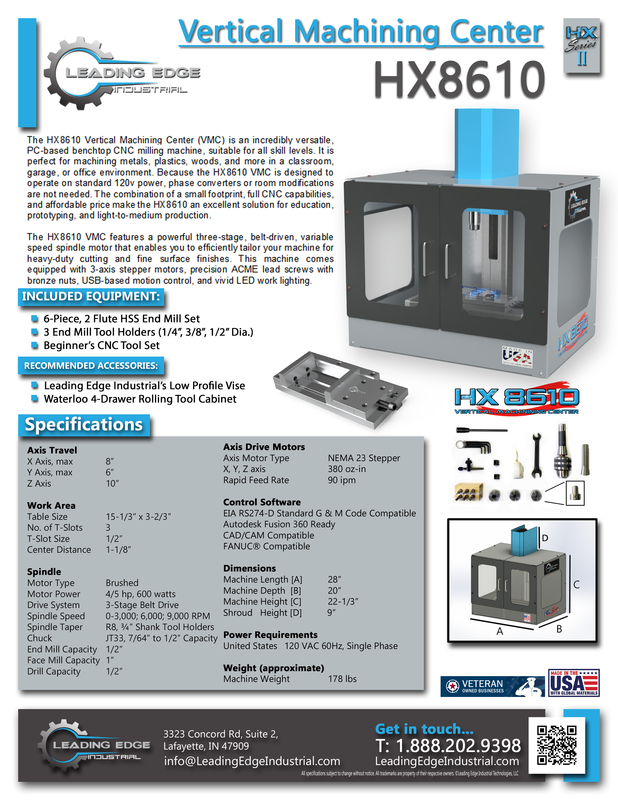 The combination of a small footprint, full CNC capabilities, and affordable price make the HX8610 VMC an excellent solution for education, prototyping, and light-to-medium production. The HX8610 VMC features a powerful three-stage, belt-driven, variable speed spindle motor that enables you to efficiently tailor your machine for heavy-duty cutting and fine surface finishes. This machine comes equipped with 3-axis stepper motors, precision ACME lead screws with bronze nuts, USB-based motion control, and vivid LED work lighting.